The City Hospital, as seen from the south end of the Fayetteville Public Library in August 2012. 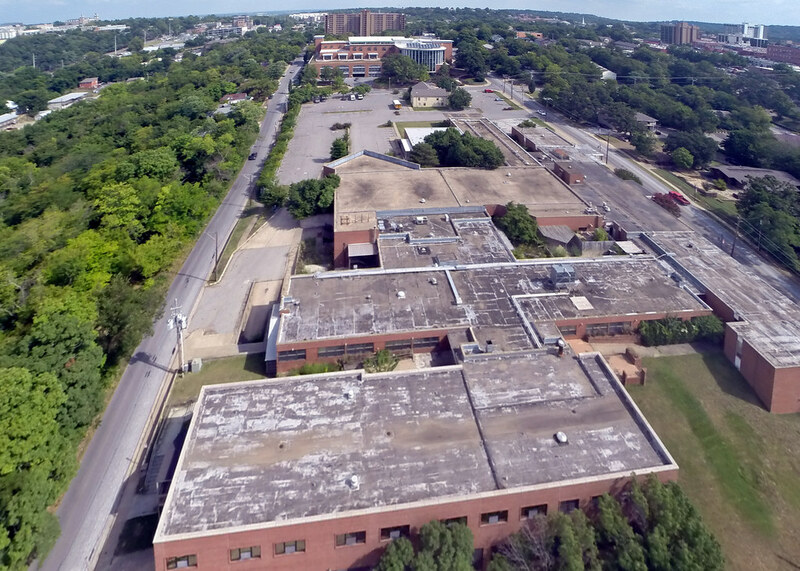 This week’s kickoff of the Fayetteville Public Library expansion served as a reminder that it won’t be long before the old City Hospital is gone for good. 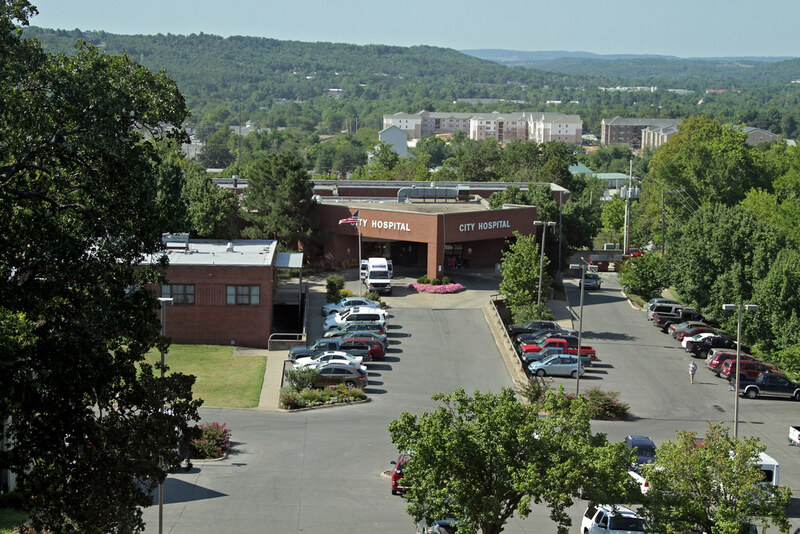 During the ceremony, Fayetteville Mayor Lioneld Jordan dedicated his remarks to honoring the hospital property, which he said had been a cornerstone of the Fayetteville community for over a century. The building closed in 2012 after 100 years in downtown Fayetteville at the corner of Rock Street and School Avenue. After serving as a hospital for 81 years, it transitioned to a nursing home operated by Washington Regional Medical Center in 1993. The hospital site, as seen from the north looking toward the Fayetteville Public Library. As the building began to show its age, the fate of the land became uncertain. Would Washington Regional continue using the outdated facility or would it eventually be vacated? Would any other hospital entity step forward to lease the aged complex? Selling the land, according to City Attorney Kit Williams, wasn’t an option at the time. Williams said the Stone Family’s dedication of the land to the city in 1909 included a stipulation that the property be used only for hospital purposes. City Council members eventually agreed to trade the deed to Washington Regional in 2011 in exchange for land needed to build a traffic roundabout at Futrall Drive and Northhills Boulevard. Washington Regional eventually closed the nursing home and announced it would sell the property. In 2013, the library offered to buy the 4-acre site for $2 million to pursue its recently hired executive director’s vision of expanding onto the property. Some feared the library’s bid was too low, considering the property had recently appraised for $3.29 million. Two real estate developers had also submitted bids, including Specialized Real Estate Group, who offered $2.275 million for the land. The company later withdrew its bid after learning the library was interested in the property. The other active bidder also offered $2 million, but Washington Regional officials chose the library’s bid. 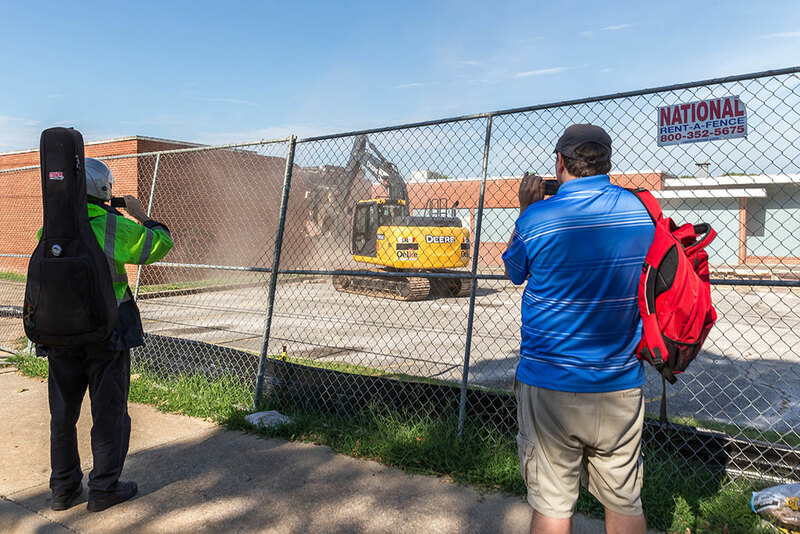 Residents watch as a trackhoe from Oelke Construction knocks down a wall of the old City Hospital building in July 2018. It’s unclear whether the complicated transfer to Washington Regional and then back to the city was anyone’s longterm plan, but it certainly created an opportunity for both parties to move forward and expand. By selling the land back to the city-owned library and using the proceeds to build a planned neuroscience institute, Washington Regional officials said they could satisfy the Stone’s deed requirements while also restore public ownership of the property for community use. While the offer was accepted, the deed transfer was held up when heirs of the Stone family claimed that their ancestors’ conditions had not been met. The issue was the subject of a lawsuit and the rights to the land were held up in litigation for four years until the state Supreme Court ruled in favor of Washington Regional. The land sale was completed in July 2017, nearly a year after Fayetteville voters approved a measure to temporarily increase the library’s 1-mill property tax to 3.7 mills to generate about $26.5 million to put toward the $49 million expansion cost. Demolition is expected to last about three months. Grading and site preparation will come after that with construction beginning in early 2019. If all goes according to plan, the new facility should open sometime in mid-2020.